This book provides a coherent story behind the sites of Rome, to lead the reader on a journey through the turbulent history of the Roman state from its humble beginnings on the Palatine hill to the maximum extent of its power in the 1st-2nd centuries A D, when almost the whole world known to the Romans was under their control. Firmly rooted in the topographic and architectural realities of today, the book will strive to give the sites a meaning and to connect them with the people who lived, fought and loved there two thousand years ago. 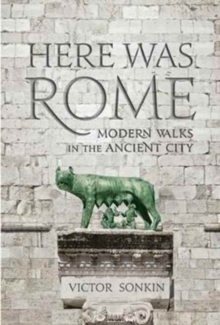 It serves both as a framework for a visit to Rome, taking in the sites in chronological order so that the history unfolds on the journey; or for the armchair traveller who will enjoy the mix of informed description, colourful anecdote and historical knowledge based on the author's lifetime of fascination with the Roman Empire.